Key lime pie seems to be the dessert of the moment. I’m seeing dessert specials all over the place featuring it, and I even saw a key lime cupcake in my FB newsfeed this weekend. I love key lime pie, but I don’t love the effort to make it. 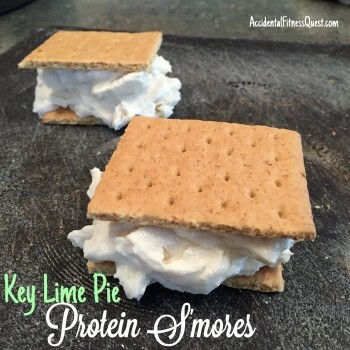 I also can’t imagine a dairy free version that would turn out well, so I definitely don’t need an entire key lime pie hanging around for me to eat. Mix the yogurt, protein powder, and lime juice in a small bowl and freeze for about 30 minutes until it thickens a bit. Break the two graham crackers in half to form 4 squares. Split the yogurt between two of the squares and top with the remaining two. Freeze for a couple hours before enjoying. Makes 2 sandwiches at 146 calories each – 15g protein, 17g carbs, and 2g fat. You can make a non-protein version by leaving out the protein powder. If you go this route, add in about a 1 tsp of sugar or stevia so that it’s not tart. All that lime juice and yogurt creates quite a tang, and you need some sweetness to balance it out.